If Varanasi is a holy city of priests and devotees, Agra is a grand city of the emperors — and you can feel it the moment you get off the train at the Agar Fort station. 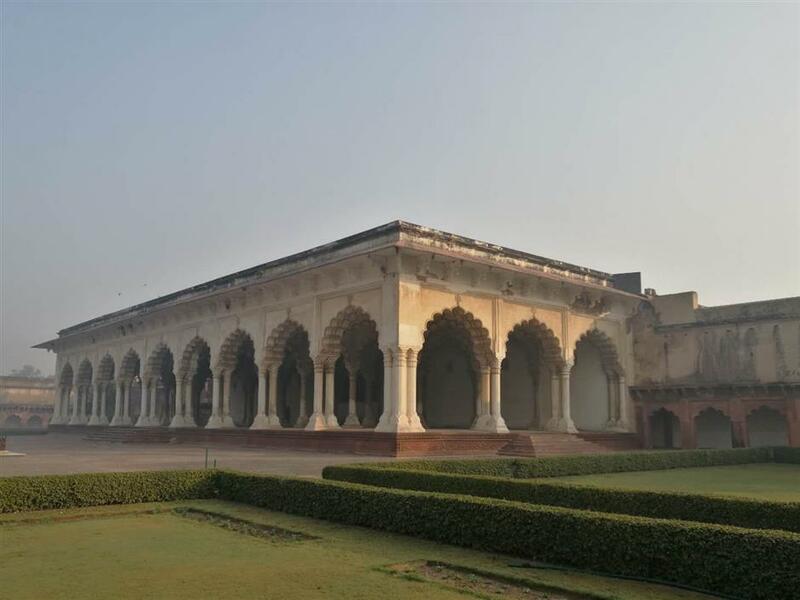 The Agar Fort, right next to the railway station, was a military base and royal residence of the Mughal Dynasty emperors until 1638, when the capital was shifted from Agra to Delhi. The Hall of Public Audience to the right of the pathway through the Lahore Gate was where the emperor would listen to public petitions and meet state officials. Contrary to the joyful squirrels who littered the ground, the huge pillared hall with the white marble throne in the center backstage gave all the authority and solemnity over its subjects standing down under. As of today, most of the white marble palaces were built during the reign of the fifth Mughal Emperor Shah Jahan (1592-1666). 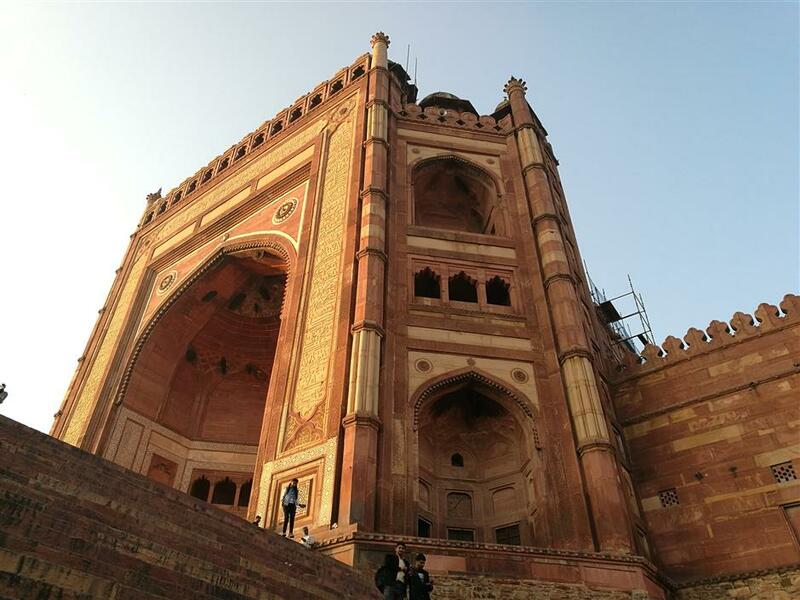 However, there were earlier buildings of red sandstone with layers of decorated columns in the inner court, which were also “of great importance to the study of Mughal buildings’ architectural history,” said a teacher to a group of students on the site. 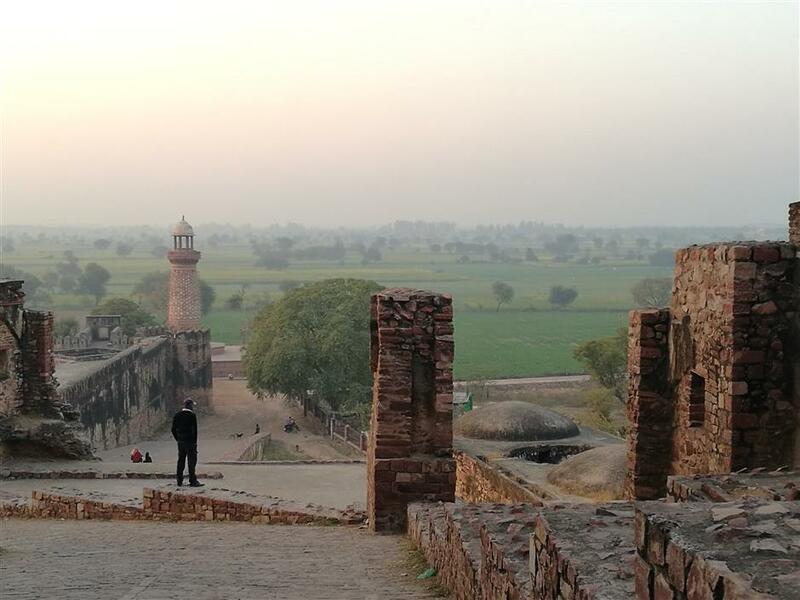 Mounted high on a rocky ridge, Fatehpur Sikri, also known as the “City of Victory,” is a palace city built primarily to afford leisure and luxury to its famous residents during the reign of the third Mughal Emperor Akbar (1556-1605), Shan Jahan’s grandfather. The city was built massively and preferably with red sandstone. The architecture features both the Hindu and Muslim styles, popular in India at the time, with large domes, large halls and colossal gateways. The Tomb of Sheikh Salim Chishti, along with the imperial complex at Fatehpur Sikri, is said to have the most delicate marble screens in India. 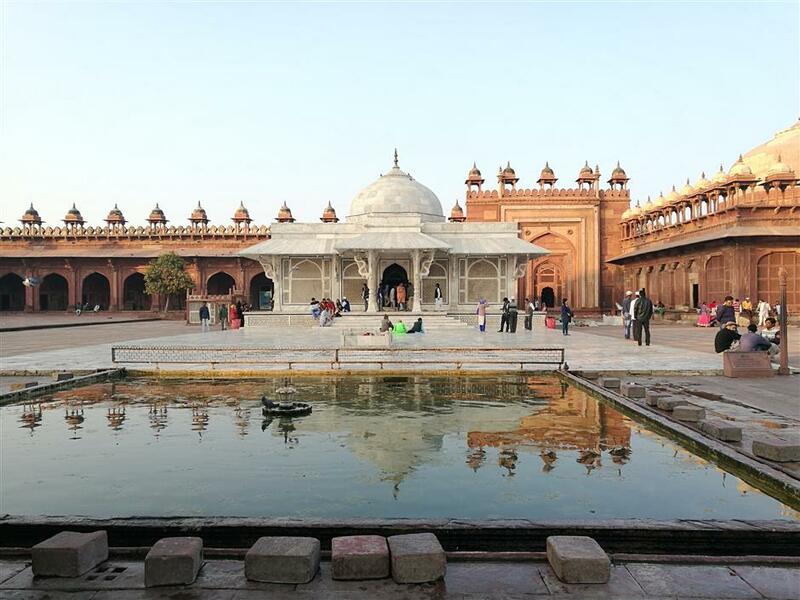 It enshrines the burial place of the Sufi saint, Salim Chisti (1478-1572), who foretold the birth of Akbar’s son Jahangir. Today people are often seen at the tomb praying for child birth blessings. With Sufi singers performing in front of the door to the chamber, visitors come in to pay homage to the saint while tying a thread on the marble screens to seek fulfillment of their wishes. Standing on top of the palace walls, one can enjoy an aerial view of the green Indian countryside with small homes dotting around the rice fields on the outskirts. It is hard to believe the city, due to a lack of water, was abandoned just a few years after its construction. Standing on top of the palace walls, one can enjoy an aerial view of the green Indian countryside with small homes dotting around the rice fields on the outskirts. 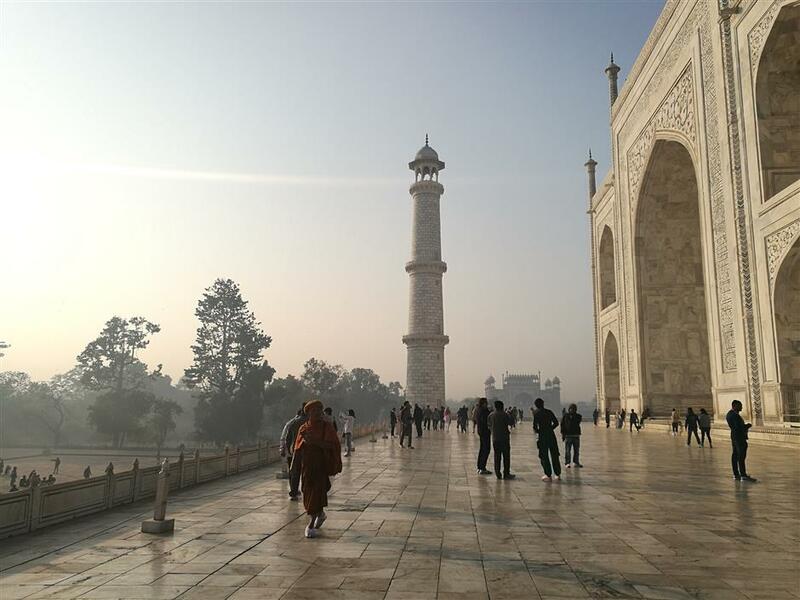 The following morning we got up early as the Taj Mahal was desperately waiting to say hello. Sitting on the south bank of the Yamuna River in Agra, the UNESCO-listed mausoleum is perhaps the finest testament to Mughal architecture. The Mughal Emperor Shah Jahan built the beautiful Taj Mahal in the memory of his wife, Mumtaz Mahal. According to popular legend, Shah Jahan spotted Mumtaz at the marketplace in his royal complex. It was love at first sight for the two, and he quickly made her his third wife. Mumtaz traveled with Shah Jahan throughout India, as his chief companion and beloved advisor. 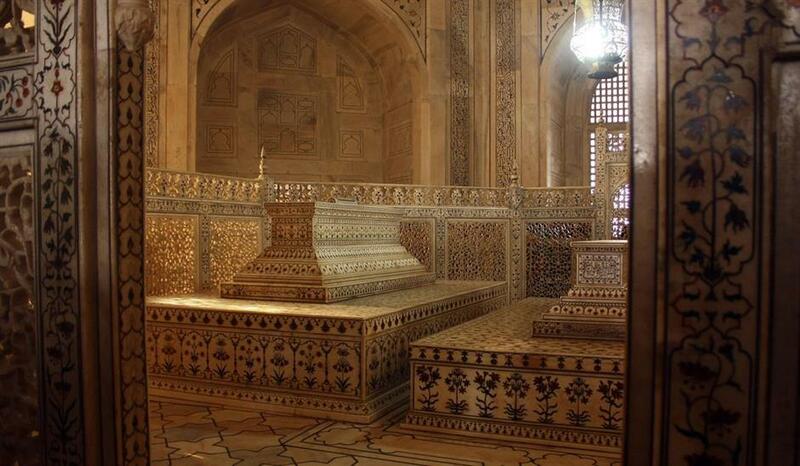 After bearing him 14 children, Mumtaz died, leaving Shah Jahan devastated. Taking inspiration from the detailed description of Heaven in the Quran, Shah Jahan started building the Taj Mahal in 1632. To ensure that no one could recreate the Taj Mahal’s beauty, Shah Jahan supposedly severed the hands and gouged the eyes of the artisans and craftsmen after construction was completed in 1647. Each year, millions of visitors come to the Taj Mahal to appreciate one of the greatest achievements in human history, and the stories of the loving couple flow from everyone’s lips like new gossip. Looming out like a mirage in the morning fog, the harmony and balance of the Taj Mahal looks astounding from all directions. Inside the building, the marble screens, calligraphy inscriptions and floral inlays were detailed to everyone’s heart content. Compared to Shah Jahan, those who built the Taj Mahal were classified as the insignificant others, like most of us who were visiting. Looming out like a mirage in the morning fog, the harmony and balance of the Taj Mahal looks astounding from all directions.